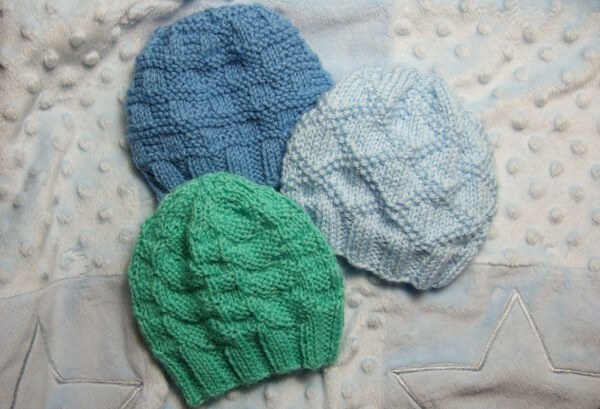 These three hats all begin with the same ribbing and can be completed with the Little Check pattern (darker blue), King Charles Brocade (light blue) or the English Diamond Block pattern (green). Instructions are given for preemie and newborn sizes. These instructions are for straight needles. See this alternate pattern for in-the-round instructions. There are patterns available for coordinating blankets for the King Charles Brocade and the Little Check. Cast on 61 for preemie size or 73 for newborn. Repeat instructions between * across row. Cut the yarn with several inches to work with. With a yarn needle, pull the yarn through all the remaining loops, secure, seam edges together, secure and weave in end. This pattern and the link to knit the hats on circulars could not have been posted at a more ideal time for me. I am trying to bring my scrap yarn under control by knitting baby hats. Thank you! Can you tell me how to expand the textured baby hat pattern for a baby of 6 months with a head size of about 17 inches. He has a big head. Thanks. You want about a “16 inch hat. Cast on 85. Thank you so much just i needed to go with the blankets. I am trying to understand the pattern and * so for the first row you knit 3, purl 3, knit 1, then start again with knit 3, purl 3, knit 1 unt,il the row is completed????? I think I just figured it out….you knit 3, purl 3, thru the whole row until your last stitch and then knit 1…. Is this right? Yes. Then for row two you purl 1 then you will knit 3, purl 3 across to the end. Does this mean I k8 on each round or just k4? Think I might have to unravel my round 1 ? Stitch both sets of k4 as you make the round. So for this round you will k4, k2tog, ssk, k8, k2tog, ssk, k8, k2tog, … ssk, k4. Unlike most of my other patterns, I only wrote this one in the two smallest sizes because it was difficult to scale the height of the hat. The circumference scales fine, but the vertical height of the stitch pattern makes them hard to scale. The newborn size is very stretchy and may still fit at 3 months. You can add 12 stitches to the cast on to get a six month size, but the height is the tricky part. Could you add a k1 p1 rib to the beginning of the hats to give extra height for the larger sizes, just thinking out loud, or would it make the hat flop, like a beret style??? That’s a good length for the body before the decreases for that size. These hats are stretchy, so if the baby’s head is 15″, the newborn size would fit it. If it does need to be made bigger, you can cast on 12 more stitches. You are absolutely correct! Thank you for letting me know. I corrected it in the pattern. do you have any teen/adult size patterns? i want to make one for myself in the same kind of style but i dont know how many stitches to cast on or how many rows to knit. i want to use straight needles and all hat patterns i have found use circular needles. You can make these adult size by using worsted or Aran yarn, size 8 needles and casting on 85 stitches. Is everything else the same in the directions- number of rows etc.? when I knit row 31 I have 2 stitches left over at the end of the row. s2kpsso = 5 stitches plus 9 is 14. 14×5=70 plus knit one is 71 leaving 2 stitches. What do I do with them. The s2kpsso only uses 3 stitches so with the 9 makes the 12 of the repeat. Would you be able to send me a picture of what you have made so far? That would be the easiest way for me to see what is happening. I just love the pretty hats. I am attempting to knit the preemie hats using the double pointed needles. When I divided my stitches onto 4 needles I ended up getting 15 stitches = 60 stitches. And of course the pattern didn’t look right. How do I knit on double point needles with 60 stitches that I need to divide to 12 stitches per needle. I’m doing King Charles Brocade pattern and I’m a beginner knitter and have become a little confused on rows 13-24 as it says to repeat rows 1-12 but 13-24 is only 11 rows. and same with 25-30 asking me to repeat 1-6 which 25-30 is only 5 rows not 6… not sure if I’m reading it wrong as a beginner. HELP! Although 24 – 13 is 11, rows 13 to 24 is 12 rows because row 13 is included. Same with the rows 25 to 30. Maybe if we all complain we’ll get the seller removed. Thank you so much for the heads up. I will act on this. How many stitches would i need to cast on if i want to make the light blue hat (King Charles Brocade) for a 3 year old? I shall not be making any more of the King Charles Pattern, nor the Little Checks, of which I tried one, and it didn’t turn out right either… Of course I was using 60 as CO!! I haven’t changed it which is why there isn’t a note about a change. There are two versions of the pattern, one that is for in-the-round which has a 60 stitch cast on, and this one that has a cast on of 61. It sounds like you had printouts of both versions of the pattern. I’m sorry for the confusion. I have just completed the King Charles Brocade pattern for straight needles and could not get the pattern correct. I only got the correct pattern for 1/4 of the hat. As II am not a very experienced knitter I do not know where I went wrong. Is one of your rows incorrect? I checked my rows by charting them on graph paper and didn’t see a problem. Here is the graph. Maybe it will help. Im making the Little checks hat. Shouldn’t rows 12 and 14 be: K1 *K3, P3*. Thanks for your straight needles patterns. They are gorgeous. No, it’s correct as written. The squares are made of garter stitch rather than a square of purl. Thank you so much for your patterns! I am wondering how I could knit the King Charles brocade for a two year old using aran wool (specifies 5mm needles)? How many stitches do I need to cast on, and do I need to adapt the pattern? many thanks again. If you make the newborn size with 5mm needles and aran wool, it should work out to be the correct size just following the directions as written. I have made each of these hats. So easy, fun and quick to make. Now I’m looking through the rest of Mama’s patterns. Thanks for making these possible. I make them for the local hospital. Thank you so much for these patterns. They are so pretty. And the fact that you made them for both straight and circular needles is great! Our group at church is making hats to give to hospitals. I cast on 73 stitches for a newborn for the English Diamond Block* pattern. I wonder if I should repeat rows 1-8 only once, instead of twice. Would repeating it twice make it too high for a newborn? ALSO, I made this before for an older child, and it didn’t look anything like the pictur, but it was ok.
English Diamond Block and King Charles Brocade should be reversed – the diamonds are in light blue, and the brocade appears to be the green. You can repeat those rows only once if you want it to be an inch shorter. I have sized it to be a bit generous so that there is some growth room. If you have a picture of the one you made before I’d love to see it. The light blue one is the King Charles Brocade. It is a diamond shaped pattern. The English Diamond Block pattern has less obvious diamond patterns. I’m almost finished knitted the hat but I’m not sure what you mean by “pull yarn through remaining loops, secure, seam edges together, secure”. How do I secure? What do I do? I have two hats that I’m at that point and would appreciate your help.